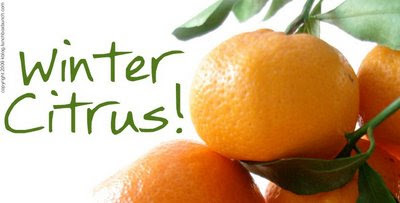 I wasn't expecting to have a winter citrus smorgasbord at my fingertips today, but for my upcoming birthday, my sister sent me a Diamond Organics Winter Citrus Sampler. And oh boy is it yummy! Ten pounds of grapefruit, navel and valencia oranges, satsumas, tangerines, blood oranges, and more! I've died and gone to citrus, vitamin c, orange zest heaven! All species are rich sources of vitamin C; they contain potassium and citric acid; and their peel contains valuable aromatic oils. Citrus pith contains bioflavenoids, needed by the body to absorb vitamin C.
NUTRITION FACTS FOR VARIOUS CITRUS FRUITS, BY SUNKIST.